A paper entitled “The low-degree shape of Mercury” by M.E. Perry et al. in Geophysical Research Letteres V 42, Is 17 reveals data from the MESSENGER probe concerning the remarkably spherical geoid and figure (shape) of the closest planet to the Sun. Additional information was gained from 378 occultations of MESSENGER radio signals when in the southern hemisphere of Mercury, demonstrating considerable interest of the scientific community in the subject. The last phrase is a weak attempt to explain the shape of Mercury in terms applied to the other terrestrial planets, but this data proves that Mercury is a perfect sphere of the same material, Iron and Nickel which crystallized within Mars for the first 4.6 billion years of its life. Mercury is in the myths of every ancient culture because it’s ejection resulted in the one hundred escapes of Mars from it’s geostationary orbits above Mt. Kailas, the spiritual epicenter of Hindu, Buddhist, Jain and Bon religions.sacred in all eastern . These 30-year cycles blasted the entirety of life forms formerly on Mars to the Earth and produced the stable continents of the Earth in only 3,000 years.. The solid core of Mars was spectacularly blasted out through the Valles Marineris one hundred times between 3687 and 687 BC, zoomed around the Earth to the East so low that Egyptian texts state it “killed men in the desert” in the first astronomical “slingshot” maneuver, allowing it to catch up to the shell of Mars as it drifted away from the Earth to the West. The releases of Mars always occurred on the vernal equinox of the 14th year of each capture due to the alignment of the Sun, Moon and Venus on those dates. Those spectacular events are etched in the memory of the world. Egyptian funerary texts of Pepi I tell that it required eight days after the ejection of the core for it to catch up to the shell. The Jews described the drifting of Mars over the Middle East at each release as Pesach, the “Passover of G-d”, which is celebrated on the vernal equinox. The Seder, Passover Festival, lasts for eight days. Perhaps in remembrance of the exiting of the core, a single day “Fast of the Firstborn” is observed on the day before Pesach. This space extravaganza, every 30-years, was observed by the first one hundred generations of human beings. The core could be seen slowly converging with the planetary shell of Mars during the eight days after it exited. In the RigVeda this period was the celebrated as the “festival of nine nights”, navaratri, beginning on the spring equinox. The corresponding Indo-Iranian noroz (nine-day) festival marks the first day of their year on the spring equinox in their calendar. It is the belief of the Persians that nowruz marked the ‘first day’ when the universe started its motion. 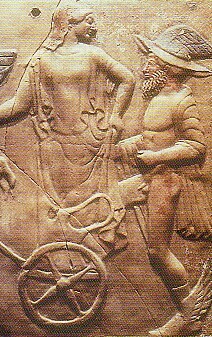 In a limited sense this is true, since the final encounter of Mars with the Earth ended on the vernal equinox of 687 BC when Saramᾱ was deflected by proto-Venus, preventing its return to Mars, and the two, Mercury and Venus, interacted for several centuries until they settled into their current orbits (Figure 1). During the same period, Mars contracted and drifted to its present freezing orbit. Astrophysicists are mystified by the absence of a solid core in such an ancient planet. Only at this date was the solar system, with which we are familiar, established. In stark contrast to all ancient texts, planetary scientists currently believe the solar system has been in its current form for 4.5 billion years because innumerable rocks blasted from Mars during its geostationary orbits, 35,000 km above Mt. Kailas, are spread across the entire solar system. ~ by Angiras on March 23, 2019.